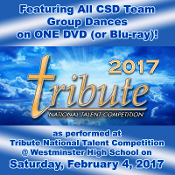 Veria Video In Association With Colorado School of Dance in Parker, CO presents CSD Teams at Tribute National Talent Competition as performed at Westminster High School on Saturday, February 4, 2017. This is a GREAT opportunity to get ALL CSD Teams dance performances (for the current season) on ONE video at a real competition! We typically do not get the opportunity to film competitions, but this is that one exception! We HIGHLY RECOMMEND the Blu-ray option, which we are offering for no additional cost. There are going to be a LOT of dances to fit on this video and the Blu-ray will definitely be the higher quality choice! Select the Blu-ray Disc option in the Video Format dropdown list below! We also HIGHLY RECOMMEND bundling your order with photos from the competition as well as video from the upcoming Dance for a Difference 2017 show! By doing so, you can save a few $$$ over purchasing separately! Not sure about photos? Click Here to view a few samples from CSD Teams 2015 at Tribute. As always, we guarantee your absolute purchase satisfaction!